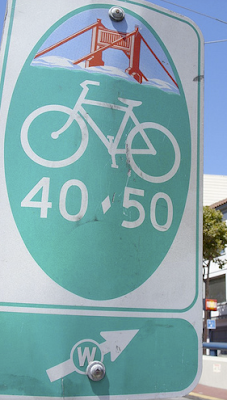 SoapBoxLA: LA's Best Bike Plan - The plan with a Backbone! The Backbone Bikeway Network is a simple yet significant commitment to supporting cyclists and their fundamental need to travel to the same destinations that attract those using other modes of transportation. Cyclists travel across town from east to west, from north to south, and the Backbone simply establishes a basic framework of priority corridors and a strategy for supporting a cyclist's freedom to move. This is the foundation of LA's Best Bike Plan as articulated in the vision statement "Every street is a street that cyclists will ride." The Backbone requires little, if any, funding in order to become a significant improvement over the status quo. The City of Los Angeles already provides many services that are key to making the Backbone the foundation for cross-town cycling, including law enforcement, routine maintenance, and prioritized repairs. Now is the time to focus them on the removal of obstacles so that the Backbone flows. Imagine if the LAPD would use the Backbone Bikeways Network as a training tool to reinforce with the patrol officers that cyclists ride the streets, that they have the right to take the lanes, that they need to get to the same destinations as others and that they are a part of the traffic mix, not an exception. Couple this "learning opportunity" with enhanced law enforcement and speed limit enforcement and cyclists would enjoy an already funded but inconsistent public service, one that would contribute dramatically to the success of the Backbone. Imagine if the Bureau of Street Services would give the Backbone priority maintenance, sweeping the curb lanes and keeping the gutters cleared, something that typically happens on secondary streets and side streets in residential areas but rarely on the larger cross-town routes. Just like in snow country, there should be a hierarchy of streets that receive maintenance attention. It would benefit all modes to put the focus on the Backbone, especially cyclists. Clean curb lanes allow a cyclist to ride a straight line because they don't need to dodge broken glass and debris. Cyclists will be able to give more attention to the traffic around them if they can spend less time watching for obstacles. Imagine if the Bureau of Public Works gave the Backbone priority repairs, conducting street work and revitalization according to real priorities of traffic rather than political pressure. In Hollywood, we've got side streets getting resurfaced but the section of Santa Monica from the 101 Freeway to La Brea has a curb lane that is simply un-ridable. Wilshire Blvd. has a curblane that has cars and buses dodging asphalt drift and potholes which is unsafe for everybody. None of this is good for the efficient flow of traffic. 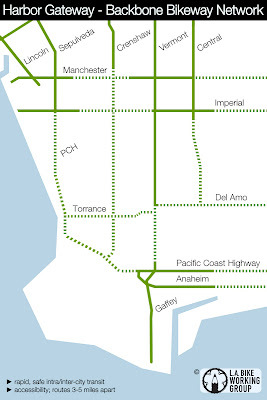 The real immediate impact of the Backbone Bikeway Network is that it provides the City of Los Angeles a focus point for the delivery of services and an opportunity to invest in "human infrastructure" instead of more cement. The significant value to be gained from the implementation of the Backbone Bikeway Network is the change in attitude, in philosophy, in actions and it starts with an investment in education, encouragement, and enforcement. During conversations over the Backbone, many suggestions have come up about the different opportunities to implement engineering solutions ranging from the "floating bike paths" to the "K-Rail separation scheme" to simpler bike lane and sharrow solutions and that is a conversation that will take place over time. The solutions will result from a robust process and they remain to be seen. For now, I recommend that the Backbone be established with great wayfinding that serves as a confirmation and as an "invitation to ride." 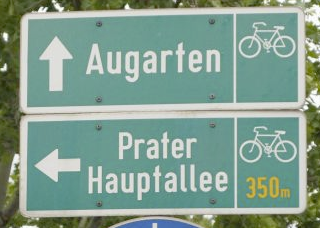 Great cities such as Munich, Sydney and San Francisco have wayfinding signs that direct cyclists to the popular destinations and have simple distances and route identities labeled. The establishment of the Backbone and the supporting signage is the foundation of LA's commitment to connectivity and to supporting basic access and mobility. As for additional enhancements, this is the time to position a commitment to "neighborhood pilot projects" as the next layer of Backbone effectiveness. Now is the time to get sensitive to the community and the local environment and to use this as an opportunity to engage the public in the development of innovations instead of tired template solutions. I'm guessing that Alex has a different idea for Venice Blvd. than what Mihai might propose for Wilshire/Westwood. I'm certain that Ron will have a great solution for Santa Monica through Beverly Hills that will be nothing like Jeremy's ideas for Wilshire in K-Town. I know Enci has ideas for Hollywood, that Dan has plans for Sunset and that Mark can certainly make Vermont a better street to ride. Regardless of what these folks come up with, we can rest assured that it will pale in comparison to what Josef has in store for Figueroa Avenue in Highland Park. The ideas and the solutions will vary from neighborhood to neighborhood and will address the many unique circumstances that occur throughout the LA area. But they all have one thing in common, the Backbone commitment to facilitating and supporting cyclists as they ride to same destinations as everybody else. The Backbone foundation supported by "human infrastructure" allows us to position "neighborhood pilot projects" so that innovations with community support can be implemented, increasing through-put with speed moderation, limiting friction by enhancing curb lanes, calming traffic with road diets and traffic calming, enhancing capacity with speed management and synchronization, and enhancing connectivity with local communities by involving them in the process. The League of American Bicyclists has a Bike Friendly America program that evaluates communities based on the "5 E's" which are Engineering, Education, Enforcement, Encouragement and Evaluation. Cities such as Portland and Boulder have achieved Platinum status, while San Francisco and Seattle have picked up Gold awards. In the LA area, Long Beach, Claremont, Santa Clarita and Santa Monica have all received slight nods from the League. A couple of years ago, the Bike Writers Collective started pushing for the inclusion of Equality as the 6th E, a campaign that paralleled the efforts of Long Beach cycling advocate and CABO Director Dan Gutierrez who has been pushing for "Equality." Imagine if we left the LAB behind and went beyond the "Bike Friendly" concept, instead using the Backbone Bikeway Network to lay down a LEED street program that went beyond the "6 E's," adding the Environment and the Economy as standards for performance. LEED standard streets would be vital connectors, not dividers, they would lose the "traffic sewer" status and instead became lifelines that enhanced the quality of life in a community instead of imposing a state of siege on a neighborhood. LEED standard streets would have a positive impact on street life, on the reduction of crime, on the improvement of health, on revitalizing property values, and on the local economy. The benefits of a Backbone Bikeway Network go way beyond simply access for cyclists and is the foundation for a new approach to mobility. The Backbone Bikeway Network is an important opportunity for the City of Los Angeles to embark on a journey of commitment, a journey of innovation, a journey of community building and it all starts on the streets of LA. The change we want will take place because we ride, not because we want to ride or because we think about riding or because we plan to ride, it will take place because our actions will change the character of Los Angeles, and the development of that "human infrastructure" is of greater value than all of the cement and paint in the world. As for me, I'll be riding the Backbone and I'll see you on the Streets!